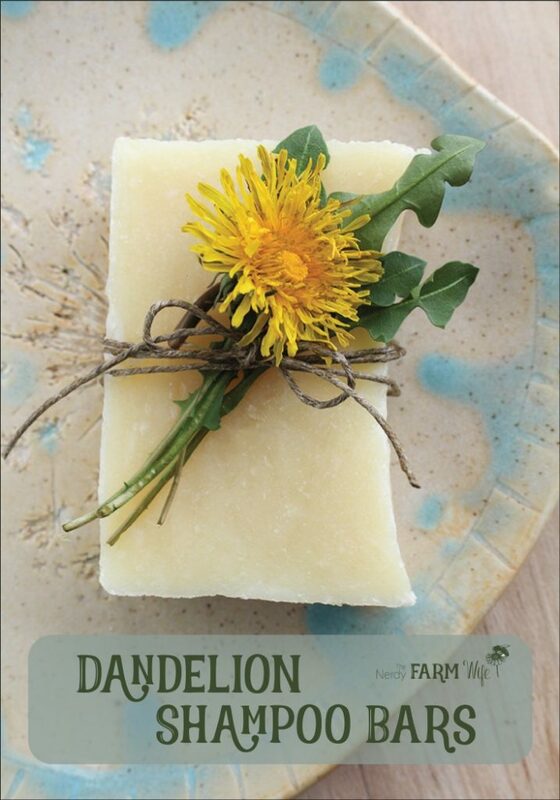 Some unseasonably warm spring-like weather, along with an extra jar of dandelion-infused olive oil I had on hand, inspired this shampoo bar recipe. Keeping in theme with the happy sunny feelings that I associate with dandelions, I scented the soap with a cheerful blend of citrus essential oils, but you can use another scent, like lavender, or leave it fragrance-free, if you wish. While I made the batch shown using the hot process (crock pot) method, I’ve also included directions for those who’d like to make a cold process version instead. Gather flowers from places that haven’t been sprayed with chemicals or used as a bathroom site for animals. Dandelions often have bugs or ants on them, so let the container sit outside for a few hours before bringing in. They are a pretty important food source for several little critters, including honeybees, in the spring, so leave 3 or 4 flowers for every one that you pick. 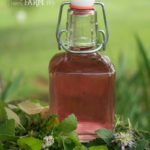 Since dandelions have a high water content, you should let the flowers dry for a few days before infusing in oil to avoid mold and potential spoilage. Spread the fresh dandelions out on a clean dishtowel or paper towels in a single layer to air dry for a few days. Some blossoms might turn to fluff while they dry, but they’re still fine to use. 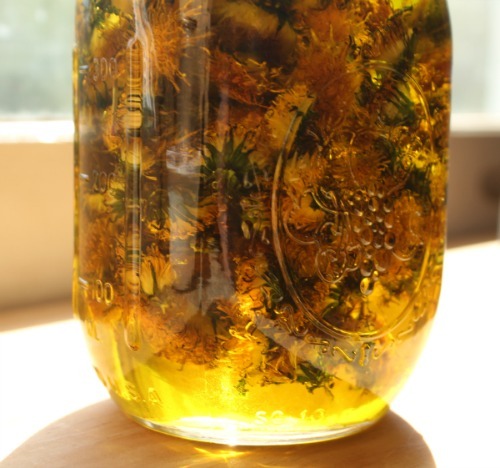 When you’re ready to infuse the oil, fill a pint jar about halfway with dried dandelions, then fill the rest of the way up with olive oil. 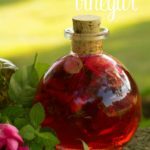 For a faster infusion: Set the oil and dandelion filled jar down into a pan of gently warmed water. Let the jar stay in the heated water, with the burner set to low, for 2 to 3 hours then remove, cool and strain. Keep a close eye on the stove during this time to make sure the oil doesn’t overheat. For the longer method: Cover the jar and set in a warm place for about four weeks before straining. A sunny windowsill works well. 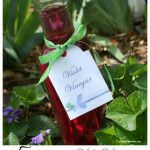 Dandelion infused oil will keep for around 1 year, if stored in a cool dark place. 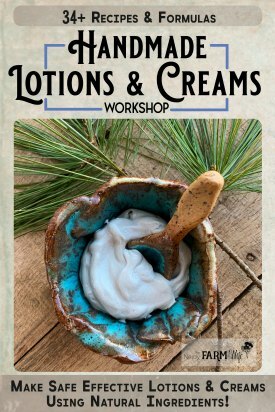 For more project ideas using dandelion infused oil, check out my Dandelion Lotion Bars, Dandelion Salve and Dandelion Magnesium Lotion recipes. Measurements of oils, lye and distilled water are by weight. An accurate digital scale is required make soap. *NOTE: Use the full amount of distilled water (10 oz/283 g) for hot process (crock pot) soap. 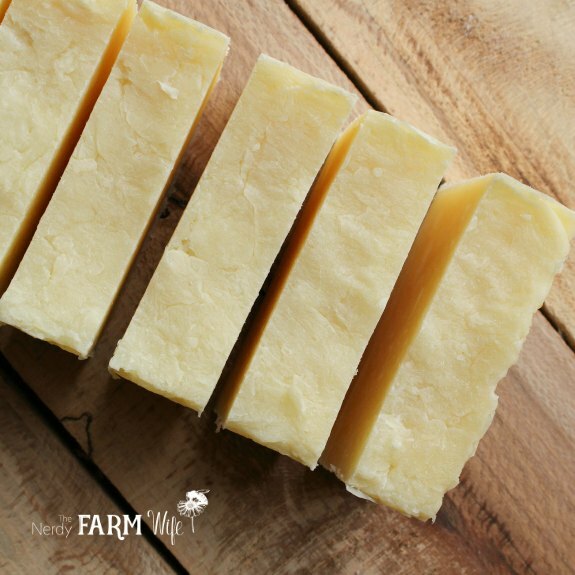 If making cold process soap you can reduce the amount of water to 8 oz (227 g) so that the soap ends up firmer and releases from the mold a lot faster. Reducing the water also shortens the amount of time needed to reach trace. Wearing gloves, goggles and long sleeves, weigh the water into a stainless steel or heavy duty plastic pitcher. I use an old Tupperware pitcher or heavy-duty plastic container from the paint section of my local DIY store. Next, weigh the lye into a small cup or container. Sprinkle the lye into the water (not the other way around or you might get a lye volcano) and gently stir with a heavy duty plastic or silicone spatula or spoon until the lye is completely dissolved. The temperature will get really hot. Set the lye solution aside in a safe place where it won’t get disturbed. 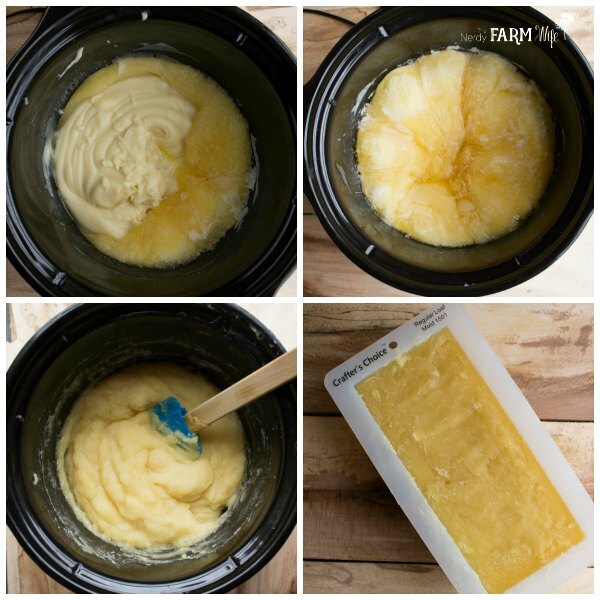 If you’re making hot process soap in your crock pot, then it will only need to be set aside for about ten minutes while you work with the oils. 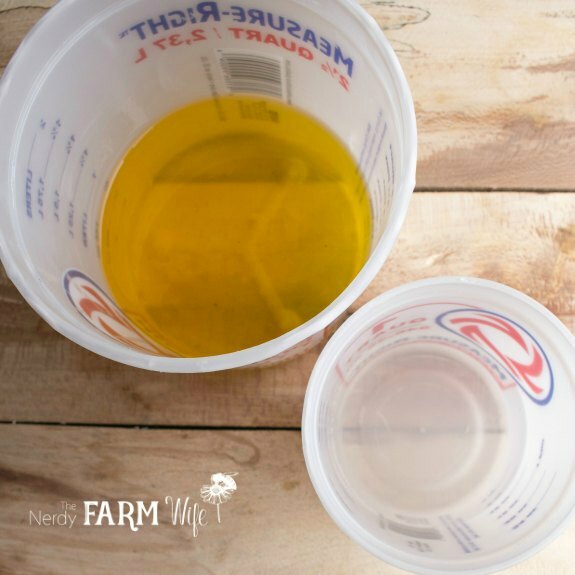 If making cold process, let the lye solution cool down around 30 to 40 minutes before mixing with the oils. 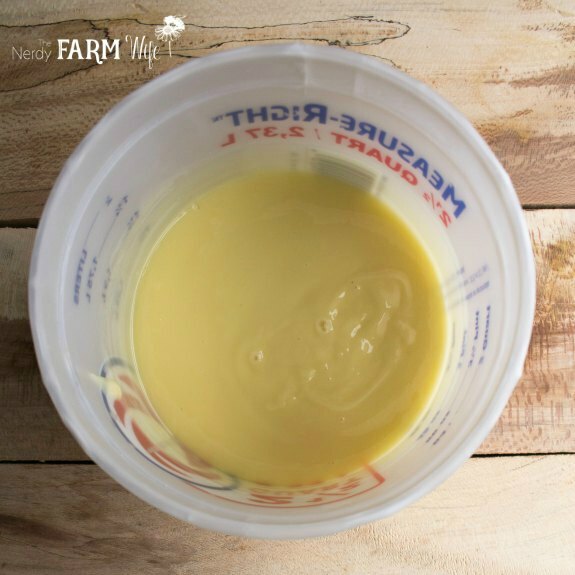 Weigh out the solid ingredients – coconut oil and cocoa butter – and melt them in a double boiler or over low heat until melted. 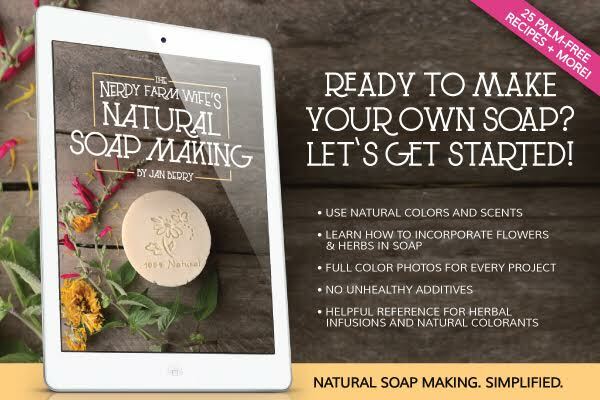 With hot process, you stir to trace, cook your soap for around an hour, add essential oil and any other extras, then scoop it into a mold, let it sit for 24 hours, remove it from the mold and you can use it right away. However, it’s not as smooth looking and hot process soap still does best and will last longer if you let it cure at least a few weeks. Once trace is reached, you can stir in any extras. In this case, I just have honey, diluted with an equal portion of water, and essential oils. Stir those into the soap batter and pour the soap into a prepared mold. 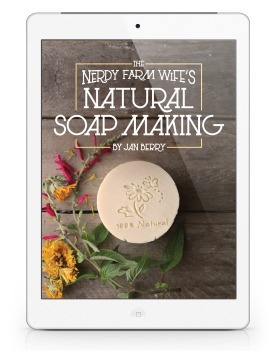 Because this soap has honey in it – the natural sugars will heat things up more than soap without – you may not need to insulate the mold. Just cover it lightly with a sheet of wax paper and let it sit for 24 to 48 hours. Peek at your soap a few times during the first several hours to make sure it’s not overheating. If you see a crack developing, move it to a cooler area. After the soap has finished cooking, let it cool for a couple of minutes before stirring in the honey/water mixture and essential oils. Spoon the hot soap into your mold and smooth the top as best as you can. You don’t have to cover or insulate hot process soap. Let the soap sit in the mold overnight then remove the next day and slice into bars. I sometimes cut shampoo bars in half again, to make “shampoo sticks”. You can use this soap right away, though the bars really benefit from curing a full 4 to 6 weeks to harden up. When using a shampoo bar to wash your hair, it’s best to followup with a vinegar hair rinse to help restore pH and remove any soap residue. This is especially important if you have hard water. You can learn more about their products HERE or click on the banner below. Tagged dandelion, shampoo bars. Bookmark the permalink. love reading and sharing your site. 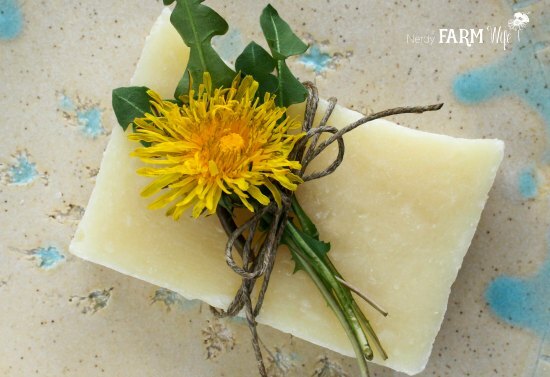 Can you dandelion infused oil be used in the melt and pour method of soap making? Not yet comfortable using lye directly. Hi Peony Rose! Yes, you can put a small amount of herbal infused oils into melt and pour soap – just a bit, so you won’t throw the balance off and make it too oily. I’m interested in knowing the benefits of the dandelion on the hair and scalp. I know there are many benefits of taking internally but what are they topically? Hi Karen! Topically, dandelion flower infusions are used to treat chapped & cracked skin or for soreness & pain. So, in this shampoo bar recipe, they’re mainly there just for label appeal. Since the flowers are exceptional for treating super dry skin however, in theory that could translate over to potentially helping dry scalps as well, but that’s just conjecture on my part. I was wondering, is it too much cocoa butter for a shampoo bar? Have you tried it? How does this feel to your hair? Thank you.